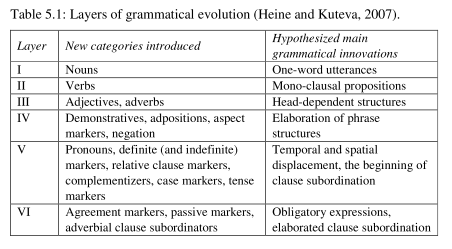 That it is possible to propose a reconstruction of how grammar evolved in human languages is argued for by Heine and Kuteva (2007). Using observations made within the framework of grammaticalization theory, these authors hypothesize that time-stable entities denoting concrete referential concepts, commonly referred to as ‘nouns’, must have been among the first items distinguished by early humans in linguistic discourse. Based on crosslinguistic findings on grammatical change, this chapter presents a scenario of how nouns may have contributed to introducing linguistic complexity in language evolution.